Essence of MOOC – I’ve been trying to filter out from all the hype and controversy, the essential and distinguishing features of Massive Open Online Courses (MOOCs) – as they are right now, out there in the field. MOOCs are About Learning – In essence, MOOC’s are concerned only with learning something, somehow. A good reason for MOOCs having a stupid but distinctive name is to clearly distinguish them from anything else – particularly traditional ‘courses’ and their associated baggage. MOOCs are Popular – MOOCs are surprisingly popular. From the very first cMOOC in 2008 the numbers of participants has continued to astonish and even overwhelm their organisers. There is a strong demand for Higher Education, however effective MOOCs may be in delivering it. MOOCs are Accessible – At a stroke, MOOCs have become freely available to thousands of students all over the globe, who, for whatever reasons, would not have had any access to Higher Education or, very importantly, access to fellow learners. MOOCs Inhabit a Massive Space – The web extends way beyond the limitations of any classroom, library – or any nation. MOOCs that climb into boxes and pretend to be traditional courses inevitably limit their potential. Diversity is of the Essence – The openness of MOOCs attracts an extraordinarily diverse range of participants, differing in so many different ways – race, culture, language, age, background, motivation … This is a strength that deserves to be recognised – and catered for. Facilitation is of the Essence – Whatever the pedagogical colours of a MOOC and whatever labels are applied (facilitators, teachers, instructors, organisers, staff, professors, TAs, sages on stages, guides by sides, …), the dedication and skills of those responsible for organising and running MOOCs are crucial. Technology will be of the Essence – Many of the difficulties suffered by current MOOCs (clunky communications, scrappy aggregation, sub-standard videos, less than synchronous sessions, crude monitoring and assessment techniques …), are down to the limitations of current technology. This is likely to improve – rapidly. Other features are maybe not quite so compelling. Serendipity is one since many MOOC participants report quite unexpected discoveries in MOOCs, or as a result of taking MOOCs. (I finally completed my first SF short story as a result of taking a MOOC on philosophy!) Also, time is not of the essence – good MOOCs never die! 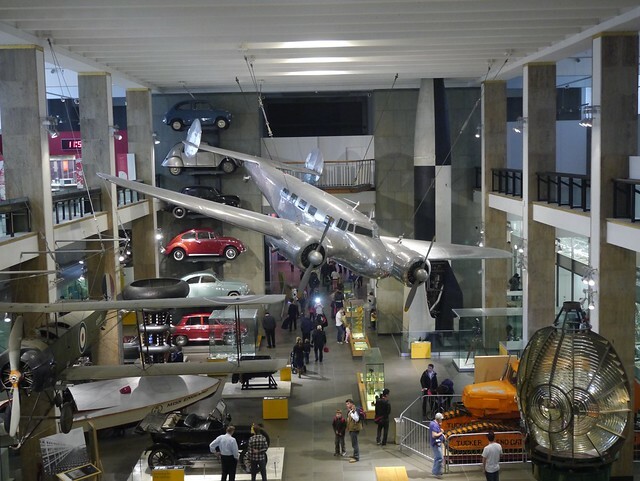 MOOCs and Museums – The Science Museum in London has always fascinated me. When I was a boy my parents could leave me there for hours, happily pushing buttons on the interactive displays or watching their amateur radio station talking to the world. Now, years later, everything is far more sophisticated but the Science Museum is still massive, open and free for anyone to enjoy and engage with and as popular as ever. Friendly experts and curators chat in small informal groups that you stumble into – or out when you’ve had enough. Excited kids with notebooks rush around doing projects and there’s a wealth of info for dedicated learners including specialist lectures at set times. 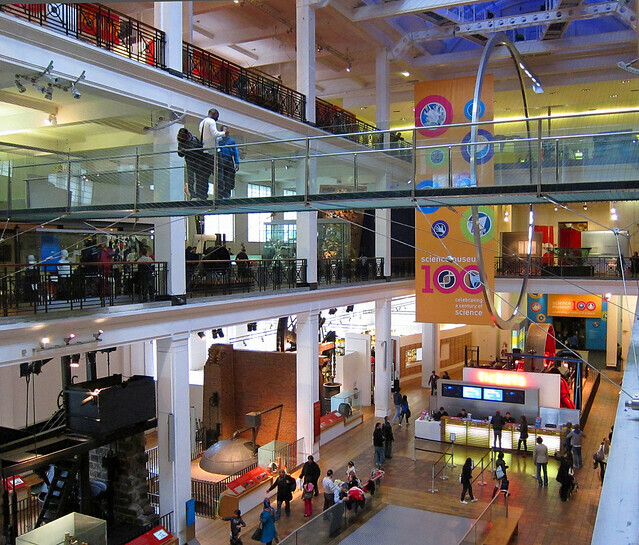 A good museum makes great use of a massive space for a wide range of open activities attracting a diversity of visitors. You might come in to study a particular exhibit or maybe just wander around looking at whatever interests you. You can follow predetermined paths to learn all about ‘Space Travel’ or ‘Climate Change’ or you might just retire to the library for peace and quiet and some deep study. Nobody calls you a ‘dropout’ or a ‘lurker’ because you don’t participate much or fail to complete some prescribed chunk of learning! There’s so much stuff around you’d never learn it all anyway. Perhaps you did learn something or perhaps you will next time you come. Your learning is entirely your own business. No analogy is perfect but isn’t this the kind of informal learning environment that the vast majority of MOOC participants, including the so-called ‘dropouts’, really want – perhaps in spite of themselves and the vested interests pushing them this way or that? Participants who drop in and out of a MOOC, perhaps returning next time round to participate again or only to download something of special interest, have a lot in common with museum visitors, coming and going – just as they please. At the end of the last xMOOC I participated in, a significant number thought the ‘course’ had been too easy and just as many thought it was too difficult. Neither opinion is surprising given the diversity of participants. Why shouldn’t a MOOC be like a good museum and actually try to be all things to all people? There’s plenty of space out there to embed anything you like in a MOOC without going too off-topic. For example, recommended paths for particular groups – ‘courses’ if you like in the everyday sense of the word ( ‘route or path taken by something, such as a stream, that moves’ – The Free Dictionary). No doubt, a relatively small but important group of learners would want to ‘pass the course’ by some sort of assessment procedure – and why not? Several MOOCs might be linked together in a single overarching MOOC, or even MOOCs within MOOCs within MOOCs – ad infinitum! The mind boggles and I’ve blogged before about ‘super-MOOCs‘ but isn’t the essential MOOC sufficiently flexible to support a wide variety of different approaches (pedagogies, facilitation styles, technologies etc) on a grand scale? MOOCs really do want to be massive!